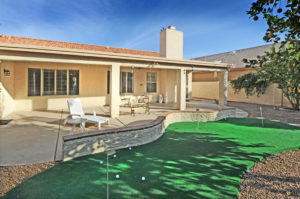 You are here: Home / Chandler AZ Real Estate / New Oakwood Country Club Home Listing at 10221 E. Hercules Dr.
New Oakwood Country Club Home Listing at 10221 E. Hercules Dr.
Are you looking for a great house in Oakwood Country Club? Check out this fantastic, 3 BR Palacia plus floor plan with 2 baths and a large kitchen that opens to family room. You can stretch out in the Great Room with a living and dining area. There are neutral corian counters with lots of cabinet space and a breakfast bar, too. With a large laundry room and built-in cabinets for storage, it’s a breeze to wash and organize clothes. And when it’s time to get ready to go out, or retire in the evening, you’ll enjoy the spacious master suite with a walk-in closet, double sinks and large picture windows overlooking the backyard. The third bedroom can be used as a den, office or hobby room. With a new soft water system, newer hot water heater, plantation shutters, and a 2 car garage with built-in storage cabinets, this home has been well maintained and is clean as a whistle! And did we mention the exclusive amenities you get to take advantage of via this Oakwood Contry Club listing? Enjoy 27 holes of golf, tennis and Pickle Ball courts, a heated pool and spa, fitness center, Club House/Rec Room, restaurant, bar, lakes, biking and walking paths, and much more! Plus, it’s a gated community with an onsite guard and Concerige. 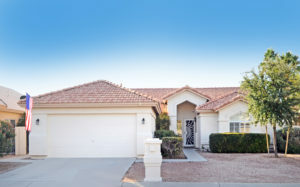 Sun Lakes AZ – resort living at its best! Ready to snap up this property before someone else does? Click here to find out more and call us at (480) 440-0849.